The Riverside police officer who was injured in a shooting that authorities have described as an "ambush" had been with the department less than two months before being allegedly targeted by former LAPD officer Christopher Dorner. Officer Andrew Tachias, identified in a Riverside Police Department press release Thursday, was sworn in Dec. 21, 2012. He was shot on Feb. 7 by gunfire that left his fellow officer, Michael Crain, dead. "I was shocked to know that the story we had talking about before, that we found so disturbing, was actually touching us personally," according to Tachias' father, Orlando Tachias. 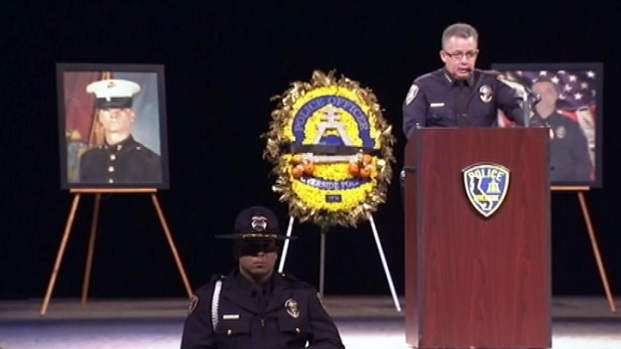 Chief: Mike Crain Was "Ideal Policeman"
Chief Sergio Diaz called Officer Mike Crain "the ideal policeman." His brother called him "courageous." A former training officer said Crain "screamed Marine." Video from Crain's Feb. 13, 2013 memorial service. The shootings were followed by an intense manhunt for Dorner that ended Tuesday in his retreat to a mountain cabin that burned down after a shootout. The charred remains found in the cabin were identified Thursday as Dorner's. "You want him to stand justice, to face justice," Orlando Tachias said, speaking about Dorner, "but at the same time you just want it to end. Tachias, 27, is in stable condition with major injuries, the department stated. He is expected to survive. Crain, his 34-year-old partner, was honored during an emotional memorial service on Wednesday. Tachias was born in West Covina and attended the University of California, Riverside, where he was a community service officer, the Riverside police news release said. He had been hired in 2009 by the Inglewood Police Department. He later attended the Los Angeles County Sheriff's Department academy, graduating in 2010 and being assigned to patrol.